Here are four new pixilated spots that I worked on that premiered on Spanish television (television in Spain, that is) this month. 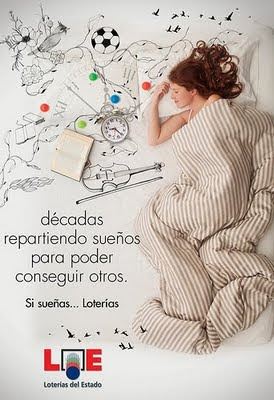 The campaign is called "Si sueñas..." and it's to promote Loterías del Estado. They were directed by Yuval and Merav Nathan, the Israeli husband and wife directors of the music video for Her Morning Elegance. These four were animated by Yuval, Guy Ben Shitrit, and myself. The stop motion puppet is the talented and patient Linn Bjornland and the production company was Acme Filmworks. You might want to hit the full screen button on these youtube clips so you can see details like the birds made out of socks or the plates exploding into forks. Thanks Justin! By the way, I really enjoyed Gerald's Last Day. I'm looking forward to seeing how your next short progresses!